Last week I on was on staff room duty at work. That means you not only help to keep the staff room tidy, but are also expected to bring a snack in for the staff. I had found a recipe that I really wanted to try as it sounded delicious, but was also nutritious. Unfortunately, I had a few obstacles and didn’t end up making the snack after all, instead I took in a batch of Aunty Myrna’s Oatmeal Shortbread Cookies. This is the plan that is yet to happen. I carefully picked out the recipes and then encountered one problem after another, with the result being “NO CHIPS FOR YOU!” (can you hear the accent of the Soup Nazi when you read that?) The first issue stemmed back to the thumb injury I sustained while cutting carrots on my mandolin slicer the Sunday before last. After having cut the tip off my thumb, I must admit I was a little “mandolin” shy, but there was no way I was slicing beets for chips without my slicer. I decided to bite the bullet and make the chips on Tuesday evening (with extreme caution). When I got home from work, I discovered that our street had suffered a water main break and that we had no water. Some how I could not see myself attempting anything that involved beets, with no water in the house! The last straw was when my search for Crème Fraîche (an ingredient called for in the dip recipe) became so ridiculous that I felt like I was on a mission in “search of the Holy Grail”. I went to not one, not two, not three, not four, not five, but six stores before giving up. It was then that I googled how to make my own. I found a very simple recipe on-line, but the mixture had to sit on the counter for 24 hours and then be refrigerated for another day. If you are following my tale at all here, you would realize that my week on staff room duty is now long gone. However, I woke up this morning to what I deemed to be pretty awesome Crème Fraîche. So, I now have Crème Fraîche, but am not sure what to do with it. I had already purchased the other ingredients for the dip, so I think I’ll just go ahead and make the chips and dip for us to try. That way, I can test the recipe before forcing it on others. I had never used it before and wasn’t even sure what I was looking for, but here is what I have learned…Crème Fraîche is thick and creamy and would fall somewhere between sour cream and yogurt. It is also generally much higher in fat. It can be used on top of fresh fruit, in crêpes, on waffles or pancakes, in dips, salad dressings or even added to a pasta recipe. Basically it can be used in lieu of sour cream or yogurt and can even replace the mayo in most recipes. It is not sweet, but less tart than sour cream. 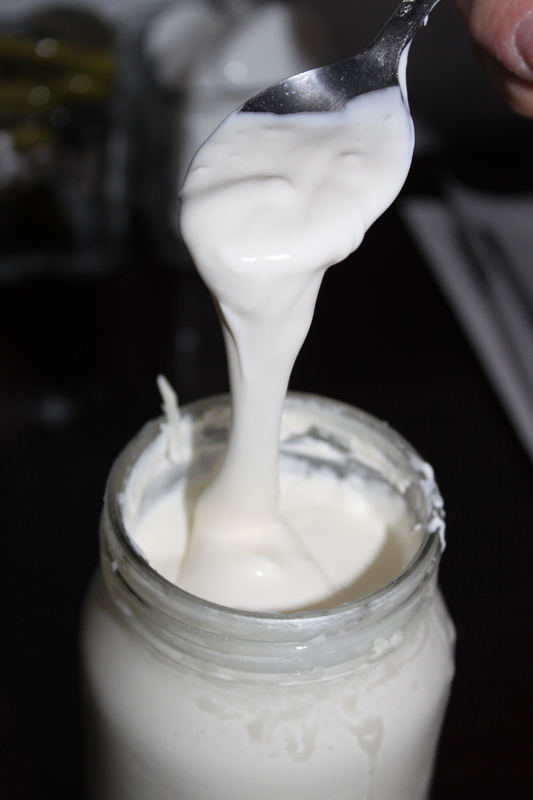 This is the recipe I followed for making my own homemade Crème Fraîche. The instructions were simple and easy to follow. The only issue I had was that the recipe called for “cultured” buttermilk. I tried to research before going shopping, but wasn’t getting a clear answer on whether the buttermilk at Safeway is “cultured” or not. In the end, I bought both the whipping cream and the buttermilk at my local Safeway. It did not say “cultured” and although I really have nothing to base my opinion on, I think mine turned out fine. It definitely thickened and is all that they say it is….creamy and delicious.